Guest Post :: Apple’s “Walled Garden” – Unsustainable Model or Certificate of Quality? Apple is one of the most recognized brands around the world, and, at least according to a recent Barron’s survey, one of the most respected. Still, not everyone is Apple crazy, as an earlier post about why people love to hate Apple indicated. Apple is always in the news, so I knew something was up when I saw the phrase "Mac-lash" being bandied about on the Internet over the past few days. "I’ve been a consumer of Apple products for a while and I’ve very definitely decided not to get an iPad. Apple is increasingly closed and controlling and I think with the iPad they’ve crossed a line to a place where the usability that Apple is so famous for is being undermined by the lack of adaptability. There are so many things that you can’t do with content on an iPad that it makes for quite a poor user experience if you are anything other than a basic user." Basically, the argument goes that Apple products differentiate themselves by (1) portraying itself as something of luxury item, (2) portraying itself as an "alternative" or "rebellious" product, (3) justifying higher prices by delivering a generally higher quality product , (4) being a closed system in which everything is designed to get you to buy more Apple products. With the iPad, Number (1) became less relevant, as prices of many of their products fell such that way more people can afford them, in the process losing some of the snob appeal. Same goes with Number (2); now that too many people own Apple gizmos and gadgets, their iconic 1984 commercial seems laughably ironic. Number (3) still holds, and Number (4) is what is angering a growing number of people. Those who argue that the closed, rigid, some would say almost "old school" business tactics, in which collaboration is insular and products don’t adapt across different platforms, puts Apple at a disadvantage with its competitors like Google. And Number (3), the idea that Apple products are still superior, easy to use, secure, and are generally of a higher quality is what Steve Jobs says makes Apple better. Jobs noted in a statement last October that open systems aren’t always better, and he attributes his products’ superiority precisely to the way he runs his business, despite it being somewhat reactionary in a climate in which "open" is the hottest buzzword. Detractors say that Apple’s success in terms of delivering hot, in-demand products, is largely attributed to Jobs’ creative genius itself, and that once he goes, Apple will go down with it. What do you think? Is Apple’s future secured, or will it have to change in some ways to keep up with the competition? Source: Mariana Ashley is a freelance writer who particularly enjoys writing about online colleges. She loves receiving reader feedback, which can be directed to mariana.ashley031@gmail.com. Earlier this week, PC World released the results of its annual "Reliability and Service Survey", which interviews customers and asks them about the tech products they use, how reliable those products are, and the quality of the services associated with those products. After interviewing over 79,000 people, PC World concluded that Apple was the best tech firm in terms of quality. Apple once again smoked the competition in the desktop, notebook, and smartphone categories, winning high praise from customers in all reliability and service categories. The Macintosh and iPhone maker did so well that virtually all its scores were above average. In addition to unveiling the iPad, a touchscreen tablet that launched a new genre of mobile computing devices, Apple enjoyed record sales and profits. And now it’s won the trifecta by smoking the competition in our reader poll. IDC computer analyst Bob O’Donnell attributes Apple’s popularity to the company’s stylish, well-made computers and its easy-to-use operating system. "It’s a combination of having high-quality hardware–you pay a premium for it–and a software experience that’s more straightforward," he says. "And if you have fewer questions, you typically have fewer problems." Apple is very good at offering extras too. "You have things like the Genius Bar at all the Apple stores. People literally walk in with their systems, and the [support] guy sits there and says, ‘Oh, yeah, you’ve got to do this, this, and this,’" O’Donnell adds. "It gives you a warm, fuzzy feeling: ‘They’re taking care of me.’ Nobody has anything close to that on the PC side." You can read much more about the results of PC World’s survey by clicking here. Sources: "Survey: Apple ‘Smokes the Competition’ in Quality, Reliability" by Jason Mick, published at Daily Tech, and "The Tech Brands You Can Trust" by Jeff Bertolucci, published at PCWorld. This survey literally took me less than two minutes to complete, so don’t say you don’t have enough time. It will remain open until Tuesday, November 9, 2010, at 5:00 pm Eastern. If you need additional motivation, a randomly selected survey recipient will win a free iPad (thanks to the good folks at Clio). The results of the survey will be shared during Jack Newton’s presentation at MILOFest in a few weeks in Orlando, FL. There is simply no comparison between a PC and a Mac. It’s like going from a stick with a rock on the end of it to a precision machining tool. [E]verything Mac does is intuitive. In start up time alone, I probably add two hours of productivity per week. The ease of navigation on the Mac and finger commands are incredible. … This probably saves me another two hours of productivity per week. Two finger scrolling within the browser, finger pinching zoom controls and related functions … make browsing the internet 50% more enjoyable and productive. Overall, there is literally no reason why any lawyer would want a PC over a Mac if they are at the decision point of purchasing a new computer. Now that I’m Mac, I will never go back. His observations are similar to those experienced by the vast majority of attorneys who have made the change to Macs. While it is easy to find former PC-users praising the Mac, you just don’t see any former Mac-users praising the PC. Gee, I wonder why? Source: "MacBook Pro for Lawyers: The Dramatic Difference Between PC and Mac" posted at The Greatest American Lawyer blog. One of my favorite websites is LifeHacker, because it routinely explains ways that I can make my life easier. It recently published an article which explained how to make "running one or a handful of must-have Windows applications on a Mac simple and seamless. It makes things much easier for non-expert computer users who just need access to an app that there isn’t a Mac version for, and it makes the user experience feel less disjointed and cobbled together. When you’re done here, you should be able to run that must-have Windows app on your Mac as though it’s just another Mac application." You can read this article here. 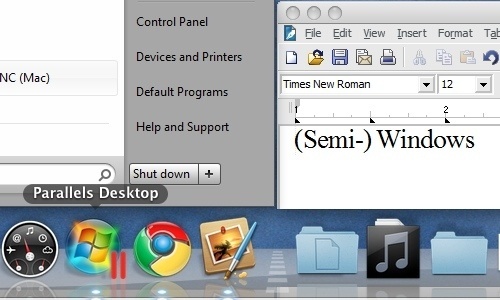 Source: "How to Seamlessly Run That One Windows App You Need on a Mac" by Kevin Purdy, published at LifeHacker.com. I just saw the Microsoft ad (for the hundredth time) where the announcer states that the buyer gets a budget to purchase a laptop. The buyer looks at the Macs and says they are too much money, or too small, or not enough memory, or she is not cool enough to be a mac person, etc. The buyer purchases the PC with the announcer’s money. I am sure you have seen the commercials. I suppose everyone would purchase a windoze computer if Microsoft gave it to them free. I would do the same thing, but the following day I would put the brand new computer on eBay and use the money toward the purchase of a Mac. Apple should run a knock-off ad where the buyer takes the announcer’s money, adds a few hundred from his or her pocket, and buys the better laptop — the Mac. Kurt Gibson opened his practice in Anderson, SC in 1995, and he focuses on bankruptcy and litigation. His law practice uses Macs exclusively, although he must use Parallels and Windows XP for one bankruptcy program that does not have a Mac flavor. Mac Pricing :: “Apple Tax” or “Microsoft Discount”? Microsoft has begun an aggressive "laptop hunters" ad campaign to attempt to convince consumers to buy PCs instead of Macs. In fact, the latest one actually shows one of their "hunters" standing outside of an Apple Store complaining about the high costs of Macs. PC advocates claim that there is an "Apple tax" – defined as the supposed premium that Apple computers usually cost over comparably equipped PCs. Mac advocates counter with the concept of the "Microsoft discount" – the theory that maybe PCs cost less because Windows is worth less. MacBook Pro vs. Dell XPS 1330 :: When configured with similar features, the MacBook Pro was only $95 more ($1,399 vs. $1,304). These machines included the following: 13.3" LED backlit screen, 4GB RAM, 320GB Hard disk, Nvidia GE Force 9400M Graphics Card, 802.11n networking, integrated webcam, backlit keyboard, and Bluetooth. The Mac has a 2.26 GHz Intel processor with a 1066 MHz frontside bus, whereas the Dell XPS 1330 comes with 2.4 GHz and 800 MHz, respectively. MacBook Air vs. Dell Adamo :: The starting price for the Air is $1,499, whereas the Adamo starts $500 higher at $1,999. In its $1,799 configuration, the MacBook Air matches the 128GB Solid Stage Drive of the Adamo and bests its 1.2 GHz processor with one that clocks in at 2.13 GHz. Both come with 2GB of RAM and no optical drive. The Air weighs one full pound less than the Adamo at 3 lbs. As it turns out, the Air is less expensive than the Dell. When I give presentations on the benefits of using Macs in a law practice, the "cost" question is one of those that almost always comes up. I have always pointed out that Macs hold their values much better than PCs, as can be easily seen by visiting eBay and looking at the resale prices of each. Now, I can point to the articles below to help show that Macs don’t cost much (if any) more on the front end either. Sources: "Reassessing the Apple Tax" by Michael Scalisi, published at PC World, and "The Microsoft Discount" by Dan Miller, published at Macworld. One of the excuses that attorneys give for their reluctance to switch from PCs to Macs is that they “need” Windows for one reason or another. The good news is that Macs can run other operating systems, including Windows, whenever needed. As a Mac-using attorney, I often raise eyebrows when people look over my shoulder to see Windows on my screen. They are even more surprised when they found out how easy it is to run Windows on a Mac. Boot Camp is Apple’s own free virtualization application built into every new Macintosh computer. It allows you to make two separate partitions on your hard drive, one for Windows and one for the Apple OS X operating system. Once you enable Boot Camp, you are presented a choice when you boot up, Windows or OS X? You simply click the desired operating system and away it goes. If you choose Windows, your installed Windows partition will load no differently than if it were a Dell or Lenovo. You can run any Windows application your hardware will support. If you click the button for Apple OS X, your computer boots into the Macintosh operating system. This, in essence, gives you two computers in one. One of the biggest advantages of Boot Camp is that it allows you to devote the entire resources of your computer to whichever operating system you choose. If you load Windows, the entire processor, memory, and operating components are driving Windows. People who operate graphics intensive video software often prefer to use Boot Camp for this reason. The fact that Boot Camp only runs one operating system at a time is also its biggest detriment. A lot of Mac users want to have the benefits of Windows and Mac OS X at the same time. That is not possible with Boot Camp. This leads to the second method, third party virtualization solutions. While Boot Camp provides a free and easy solution to run Windows on your Mac, some users prefer to run both Windows and OS X at the same time. Using virtualization applications such as Parallels or VMWare Fusion, both of which cost $70, you can install Windows (or Linux) to run as its own OS X application. These applications support any version of Windows from Windows 95 up through the recently released Windows 7 beta.